Home Beers North Coast Brewing Co.
Old Stock Ale | North Coast Brewing Co.
Like a fine port, Old Stock Ale is intended to be laid down. With an original gravity of over 1.100 and a generous hopping rate, Old Stock Ale is well-designed to round out and mellow with age. It’s brewed with classic Maris Otter malt and Fuggles and East Kent Goldings hops, all imported from England. A: garnet in color with a cream colored head that quickly fades into a film. The brew is clear in the goblet, with no sign of lacing. S: the bouquet is vibrant, with heavy notes of prunes, molasses, and spices. T: the brew is exploding with vanilla, oak, molasses, and prunes. Absolutely perfect. M: thick and creamy, with a bit of oiliness. D: the paragon of the style. A must have for fans of the style, as well as something to look in to for fans of DIPAs, RISs, and barleywines. Worth seeking out. Brown sugar, maple syrup, chocolate malt, and an underlying cherry-like alcohol/ester combo works to perfection with an alcohol culmination of rum and port wine. Malty throughout with a full and rounded start and an even fade to malty-dry finish of alcohol warmth with a linger of toffee and chocolate. North Coast continues to develop the recipe for much more sultry flavor and cleaner alcohol taste. Brown sugar and cherry-like esters give the impression of port wines and brandies. Bold toffee flavor dominates early with a follow of ripe grapes, cherries, sherry, dates, and raisons. Syrupy textures give a sticky feel, and with a follow of warming, if not hot alcohols. Seemingly a Barleywine, except for a lightened body and drier finish. These vintage ales turn out as beauties after a few years of age. Still strong flavored with malts and very warm with alcohols, but a lot smoother and more appreciable than the 'fresh' releases. This has all the flavors aromas and textures needed in an Old Ale, but must be respected as a brandy. The regular 11% version with over a years worth of cellering. The beer matures wonderfully in about that time's span. Not nearly as alcoholically intense or fusal as it was last year. Sweetness dominates and the hops have fallen out, leaving a well balanced, quite clean, characterful, fruity, syrupy joy to drink. I do beleive that this beer can handle another year of maturing before tiring. Great way to close the evening. Is the sanctity and purity of Old Ales no longer respected. 13%? What's next. The beer is as flavorful and strong as ever. Very syrupy, malty, thick, and alcoholically harsh. More age will definately mellow the brew and meld the flavors, but for now, it's just tough to drink. The hops are too fresh. The alcohols are too hot and abrasive. The malts are too sugary. Still, a wonderful beer, but one that must be babied and approached with caution. Surprised to have never rated an Old Stock. These are one of my favorite 1-off resease beers. This '05 abounds from the bottle and into the glass with big syrupy, brown sugar, molassas barley flavors with as spicy, hoppy, and bready scent. Alcoholic aroma promises strength to accompany the sweetness. Tastes of strong malts that hinge on dates, molassas, walnuts, and dried cherries. Hop bitterness and flavor round out the sweetness and all boldness without getting too harsh. Strong alcohols boarder on hot fusals and sweet thinning. Moderately heavy, thick, and smooth on the palate. Weakens a bit into the finish to become more easily drank. Another winner for North Coast. Found a 4 pack stocked away at a local beer store. As I remembered, this beer had all of the right ingredients, but quite hot and fusal. Hoping that a couple of years would have mellowed it out. Not so. There are big plumb, fig, and prune flavors with an unneccesarily fusal hot character; too much to ignore. Light chocolate and cherry flavors help, but the heat and hops combine for a tough drinking beer. A heartburn just waiting to happen. Otherwise, a solid brew. Wonderful rich beer with rich toffee notes, big chewy body, and perfect balance of hops and malt. Not boozy, as some have noted, but a nice warm coat gently being draped over you. Pours with a great deal of effervescence that continually fuels a thick fizzy head. Great barley brown color. Lots of strong aromas as I can smell it from three feet away. Barley malts, grainy, earthy, caramel, toffee, dates and light prune mix with a tinny alcohol. The front end reveals dark fruits; prune, date and raisin. Mid palate has the malts and grains. It ends a little sweeter with caramel, molasses, sorghum and apricot. The feel is a little hot but I served this at about 60F so that should have finished most of the booze. Great beer, wonderful winter supper. 2012 Old Stock Ale consumed on 4/16/15. Very hazy body. Looks sort of like a barleywine. Big aroma of dark fruits. Lots of raisin and plum flavor. Has the mouthfeel and maltiness of a barleywine. Pretty darn good with a few years on it. Just did a vertical of the 2010, 2013, and 2014. 2010 was more fruit and plumb flavor. 2013 was a nice balance of malt, fruit and hop, and 2014 was more brash and hop flavor. A nice ale regardless of the year! Appearance  Dark, thick, heavy brown with a beautiful tan head that almost stayed the night and left some cool lacing (I thought high ABV ale wasnt supposed to lace?). Smell  Big, strong aroma of dark, heavily-sweetened malt. The sweetness comes mostly from dark sugars. Everything is very strong, dark, and soaked in alcohol. Taste  Amazingly, this is nowhere near as harsh as I thought it was going to be from the nose. The toasted malt is there, juicy and firm. The sugars are enormous. This is one of the most sugary, syrupy, ales that Ive ever had. I can pick up some dark fruits, but mostly its brown sugar. Lots of alcohol, too, but not harshly so. Mouthfeel  Chewy, gooey, and sticky. This almost full-bodied ale is a mouthfeel. Its also a lot smoother than I thought from the sharp aroma. Drinkability  At 11.5 ABV this one is a real sipper, although Id be lying if I said itll last me the night. This is good stuff and belongs in the tummy. Hmm! Update  I remember this being a gem when I first had it in 2003 and wanted to try an 04 batch in 05 to see if it still blew me away. Boy, did it ever! This beer smells scary, like its going to kill your taste buds and burn your throat all to hell. But, after the first swig, trust ensues. You can still sense the strong ABV, but this ale is extremely smooth and flavorful. One of my all time favorites! A: Large foamy head poured from the bottle. The fine, off white / khaki colored head had great persistence and left a layer atop the beer that stayed for even longer. Alcohol legs kick up when swirled and slowly glide down the edge of the mini-snifter. The beer is a dark mahogany / rosewood color with excellent clarity. S: Tons of big malt character. Sweet toffee, raisins, caramel and dates. Melenoidin character comes through prominently along with toasty bread sweetness. Medium earthy / herbal hop aroma and a slight alcohol bite. T: Moderate bitterness with herbal hop flavors blending into the middle then dropping off in the end. The super complex malt bill is the star of this beer Mellenoidins for days, toasted bread crust, raisins, caramel, dark cherry and other bready bakery flavors. The sweetness is high in the middle and end where the hops drop off and there is a slight hottness to the alcohol. In a weired way it reminds me of a cough syrup beer. M: Big alcohol warming in the chest warms you right up - good winter beer. Low carbonation with a substantially big body and viscous mouthfeel. 2017 bottle. Aroma has brandy, figs, maple, apple, molasses, sweetness. Taste is big and sticky, dominated by a rich molasses sweetness. Leather, earth, pine, raisins, dates, and pepper play at the back of the tongue. Alcohol burn in the aftertaste is rather bourbon-like. Vinous and exceptionally chewy, this is one of the most liquor-like beers Ive ever had. A brash, boozy, complex beer that I think will be much improved by age. A - Murky mahogany brown. Fine dark bone white head pours a quarter finger high but hangs around with nice retention. Low lace. S - Sweet and surprisingly bright. Butter scotch, lemon, maple syrup, amaretto, and bread crust. T - Smooth caramel, fruitcake and butterscotch with a toasty amaretto backdrop. The impression is net sweet, but the boozy warmth and bright carbonation bring a really nice balance to the beer. M - Silky smooth with a medium light frame. Warm finish. Really nice carbonation. O - A really nice example of the style. The 2013 is drinking really well. Time has improved this beer so elegantly that it was enough for me to revise my less than flattering original review, deleting it altogether while enjoying this 5 year old 2013 bottle consumed in late 2018. The body is like a dark amber maple syrup, with a light, persistent tan blanket that fades to a chain around the edge. Aroma exudes cinnamon apple, plum and liquefied raisin up front. The middle nose has toasty aged oak and tree bark with fainter accents of light smoky molasses and grape. Taste features a sort of toasty caramel and graham-like biscuit with faint accents of brown sugar, prune, and an almost bourbon barrel sort of char or a prickly, peppery vanillin that tingles with a slight heat. The surprisingly moderate to light body has a mildly crisp effervescence with a tingly, perfectly semi-dry finish. Old Stock is one of the OGs that set the standard, and it certainly does not disappoint after all this time, holding up astonishingly well. One of the rare barley wines/old ales made in the US that can compete with the English classics. Brownish copper in color. Nose is malty and bready. Rich , sticky and full-bodied. Molasses sweetness is the highlight here. Alcohol esthers are a bit too tuned-up on the finish. This offering would be an excellent candidate for aging. Have sampled many versions of this one, from 2014 through 2017. The best so far, is, oddly, the most recent, 2017. However, although the recommended serving temperature on the label is 60 F, I have found, through experimentation, that removing it from the fridge and then letting it sit in the Freezer for 30 minutes, or until it forms frost on the bottle upon removal, renders the smoothest feel on the tongue, and thus the pallet. If you've gotten it from your favourite establishment at room temperature, the freezer term will expand to 90 minutes to achieve this fabulous effect. Trust me, you will not regret doing so. In fact, many other Ales will respond in kind to this sort of treatment, despite the advice of purported "experts." In fact, my girlfriend, who curled her lip at the very mention of an ale, was surprised by how delicious the above mentioned process transformed that which she previously snubbed her nose. Enjoy, my friends, and inform me of the results of your experiments! Poured a dirty looking amber, cleared up with time and temperature. Head was surprisingly active for a 3yr old high gravity ale. Produced a one finger head that slowly reduced to a thin layer, but would respond on command. The inhale was intoxicating, I was getting a light alcohol warmth with candy like notes of cherries, bubblegum and caramel. Almost like a tamed down cough syrup with out the medicine. Flavors were complex and rich, evolving as it warmed up. Picking up sweet boozy malts best described as rum cake. The one problem with this beer is that I could not keep the glass on the table, as soon as the aftertaste receded, I found my arm reaching for another taste. It went by too quick. Everything improved on this towards the end. I would love to have a do over and drink this at room temperature start to finish. Oh my! This is some headache material just waiting to be consumed! Thick ruby colored beer, coffee colored foamy head that relaxes to nothing quickly, but there's plenty of carbonation going on. Steely caramel aroma, very sweet smelling and inviting. Mouthfeel is viscous, chewy and very full to the palate. Massively sweet and complex in the malt department. Loads of caramel, assertive raisin, notes of chocolate and plenty of coffee (two creams and sugar-like). Light bitter edge flows into an immense alcohol spice. And right about at this point you think "Oh my! ..." as the warming alcohol bathes your noodle in its sublime pool of numbness and brings some redness and heat to your cheeks. Finish is sweet and full of fumes from the alcohol. A bit of expected oxidation in the form of wet paper, but other than that this 2002 vintage is a freagin' rockin' example of an olde school Old Ale! no need for a freshness date. a bit sticky yet again, thin. raisins? A malty and alcoholic aroma. lots of malt. Sweet yet pleasing finish. Notes: One of the few old ales I have had from an American brewery and an excellent job they did. The maltiness hides some of the 11.4% abv and there seems to be a good bit of balance even after it has aged for a good while. Poured into a snifter at 55 degrees, had been cellared upright for exactly 3 years. L - Pours a dark amber/brown color with a 1 inch head. Lacing remains down the side, but spotty. Bubbles forming up the snifter. S - Very malt-y, boozy and earthy. Reminiscent of a proper Old Ale. T - This is where the complexity begins. Getting a lot of different tastes here. Beginning with Marris Otter malt and finishing with the (seemingly) fresh Fuggles hops. The aftertaste bursts with caramel and booze, still burning after 3 years, could probably sit for another several years to allow things to set and combine. Still delicious though, but in small sips every now and again. F - Thick, robust, full and carbonated. Nothing too overbowering, but enough to allow my palate to retain the entire flavor of the beer. Perhaps the highlight of this fine brew. O - An excellent take on the easily obtainable Old Ale. Unfortunately, I think this style is lost, and I love how North Coast is continuing to make this extraordinary. Compared to the 2015 version, this is incredibly different but in a good way. Will probably pick up another bottle and allow it to age for longer. NC really got it right with this one. A: The body is the color of a russet brown with some dark ruby tones. Showing off some bubble action there with a minor amount of clarity to it. A cautious pour produces a nice even layer of dark khaki cream across the top. Moderate holding strength to it with only a few dots of stick noted. More so has the alcohol legs going. S: Caramelized fig and sugary vanilla bean meets rum soaked breads and spiced plum. I get notes of leather and tobacco signature of that Maillard reaction in an Old Ale. Has a molasses sweetness to it all throughout and a bit of stinging alcohol presence in the nose. Very nice and on point with the style. T: Flavors comprise of vanilla toffee and caramelized fig, darkened breads, and nutty toasted malt grains. Not unlike a candied nougat here. Getting some tart plum like fruity esters noted. Subtle leather and molasses. Leafy bitterness as well with a dose of grassy alcohol spice. Seemingly hot in a way but not really in a detracting manner. Has an almost vinous note about it like a sherry wine. Really well balanced at near 12% ABV I would. Very tasty indeed. M: Medium to full bodied. Lightly creamy on the palate with a lower perceived carbonation feel. Some modest hop bitterness there with a good amount of warming alcohol. Nice lighter drying effect to the finish. D: A well groomed sipper. The perfect companion to your favorite lounge chair and a good read. One of the better takes on the Old Ale and exemplary of the style I would say. Often taken for granted here with its availability. Very comparable with Bell’s Third Coast and both being solid renditions of the style. I am giving a slight nod to North Coast for a touch more depth and complexity in flavor and better overall balance here. Cloudy dark Amber color. Thin head that dissipates quickly. Dark fruit smell of raisins little banana flavor. Taste of caramel brûléed sugar and sweet bread. 2006 on tap at the Comsumer Beverage in Orchard Park,NY.Great to see this highly anticipated annual offering at the growler station at Consumers,pours a rich deep amber with a thinner but well retained creamy-like off white head.One word to describe the nose would be rich just rich and almost warming dark fruit,caramel,brown sugar,and a real alcohol zip as it warms to the right temp,this beer is big and brash to say the least its fresh and nothin is holding this puppy back.Starting out a little sweet with raisin/prune and brown sugar notes up front with that warming alcohol always prevelant a nice drying earthiness shows up late and I thing really cuts thru the sweetness even now at such a very young age a touch of hoppy leafiness shows up as well.This growler is going to be drank slowly over a few days its warming,rich and ever so smooth but the alcohol keeps me from going overboard on it and I think its a good thing,I'll by a bottle and hold and see how it ages.Masterful. Had a 2013 & 2015 back-to-back. Nose brings lots of oak, dark fig, raisin, a little honey and cherry. Taste has an easy heft from the barrel, a little peaty and smokey but very smooth. The '13 gave me more of the dark cherry and fig flavor, the '15 had much more of the woody oak, obviously. Both had excellent mouthfeel, very slight carbonation giving in to a silkiness, but not oily or viscous. Preferred the '15 a little more but a fantastic beer either way. Picked up a 12 oz 2012 edition bottle of this. Let's see how this goes. A: Pours, like others have said, a hazy brownish-red color. Around a half finger of head. Good amount of bubbles. S: Definitely boozy, but raisin-y/molasses as well. Intriguing on the nose. T: Holy wow. I did *not* expect this, even after reading the other reviews. Can't taste the alcohol really at all, which is surprising at this level of ABV. Definitely get the raisin, vanilla notes that others wrote about here. Very complex. M: Slightly syrupy is an appropriate descriptor here. Definitely thicker than other beers, but not at all a negative. It's... different. O: Spectacular. I'm going to get a few of these and cellar them and see what happens. I'm very glad that I pull up BA on my phone whenever I'm in the liquor store! 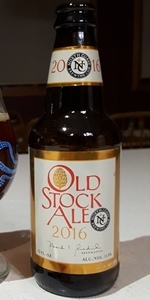 Old Stock Ale from North Coast Brewing Co.